Marsh House continues to be a real hotspot in The Gulch, the popular neighborhood that draws tourists and locals. Marsh House is located on the ground floor of the trendy Thompson Hotel, with a trendy space and fantastic Southern-inspired seafood. Owned and operated by QED Hospitality out of New Orleans, Marsh house has quickly become a go-to destination for diners seeking out a taste of Louisiana in Music City. In fact, executive chef Nathan Deunsing and pastry whiz Lisa Marie White both offered special items to get Nashvillians through the Mardi Gras season. According to the Nashville Scene, the talented duo represented the best place to get your Fat Tuesday fix with special Mardi Gras menus and custom King Cakes. 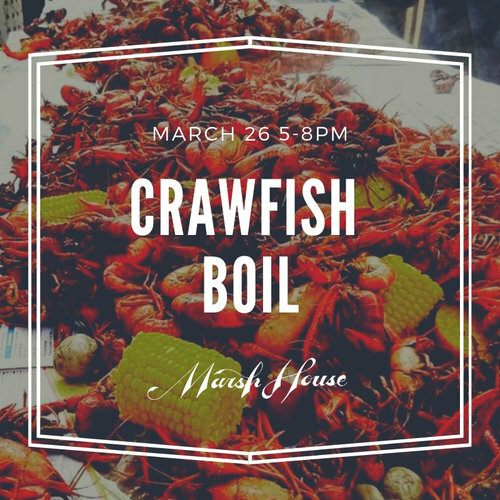 If you missed out on your chance to enjoy Marsh House’s bacchanalian fun, they’ve still got another opportunity for you to experience a little bit of Louisiana “fais do do” with an upcoming crawfish boil on Tuesday, March 26. From 5:00 until 8:00, they’ll be boiling up all-you-can eat mudbugs for just $25, a price that includes beers from the good folks at Black Abbey Brewing Co. for anyone over 21. They do ask that you make reservations in advance so that they will know how many bags to boil, so grab your ticket at the event website. Laissez les bons temps rouler!